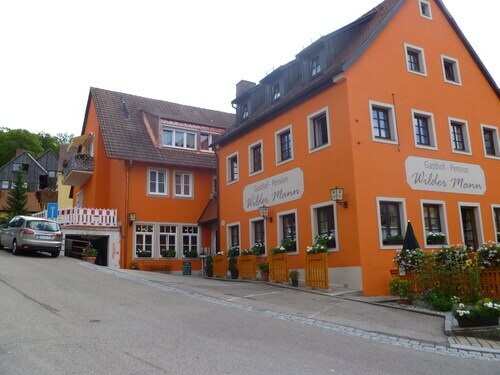 Situated in Aalen, this hotel is 0.1 mi (0.1 km) from Limes-Therme and 1.5 mi (2.4 km) from Limes Museum. Ellwangen Abbey and Alamannenmuseum are also within 16 mi (25 km). Located in the heart of Heidenheim an der Brenz, this hotel is within 1 mi (2 km) of HellensteinBad Aquarena, Brenzpark, and Hellenstein Castle. Wildlife Park Eichert is 1 mi (1.7 km) away. Heidenheim Station is 19 minutes by foot. This family-friendly Heidenheim an der Brenz hotel is within a 15-minute walk of Hellenstein Castle and Wildlife Park Eichert. Steiff Museum and Charlotte Cave are also within 9 mi (15 km). Heidenheim Station is 13 minutes by foot and Heidenheim Voithwerk Station is 24 minutes. Located in a rural location, this family-friendly hotel is within 6 mi (10 km) of Dinkelsbuehl Golfclub, Museum Kinder-Zeughaus, and St. George Church. Stadtmuehle Museum 3D and Haus der Geschichte Dinkelsbuehl are also within 9 mi (15 km). How Much is a Hotel Room in Westhausen? 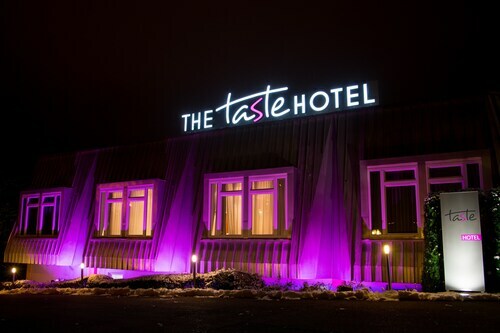 Hotels in Westhausen start at $81 per night. Prices and availability subject to change. Additional terms may apply. Considering there is just 1 hotel within an easy drive of Westhausen's downtown, it's wise booking a room well in advance. The nearest Travelocity hotel is the Vital Hotel Meiser, Bavaria, which sits 14 miles (23 kilometers) from the downtown precinct of Westhausen. A secondary Travelocity hotel is the Hotel Goldene Rose, which is located in Bavaria, 13 miles (21 kilometers) from the heart of Westhausen. 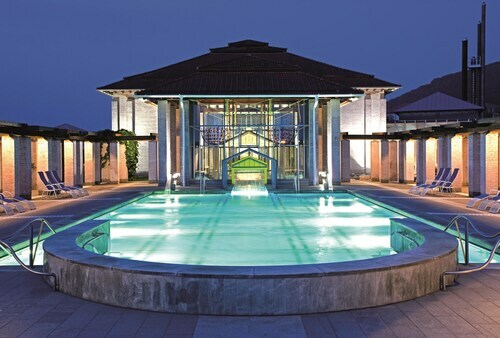 The Best Western Premier Schlosshotel Park Consul is around 15 miles (24 kilometers) outside the middle of Westhausen. 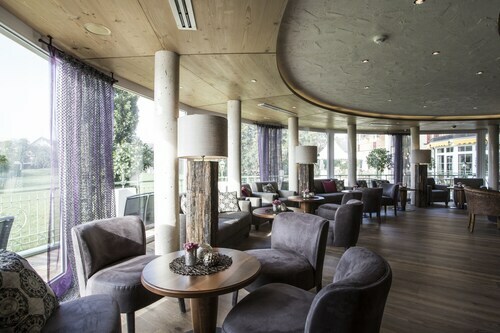 An alternative place to stay is the Klozbücher Das Landhotel, which is approximately 8 miles (13 kilometers) away. Some other possible Travelocity-listed hotels include the Hotel Restaurant Piazza and the Landhotel Garni Engelhard. Got plans to move a little further afield? Baden-Wuerttemberg offers many options. Investigate Baden-Wuerttemberg's castles. Visitors should leave time to relish the region's rivers, streams, lakes and mountains. In this region of Germany travelers can enjoy snowboarding and skiing. While you are in Ostalbkreis, you can visit the Limes Museum and stay a few nights in Aalen, which is 5 miles (9 kilometers) to the southwest of the center of Westhausen. The Ramada Hotel Limes Thermen Aalen and Apartmenthaus Renz are among the choices. If you are interested in sport and enjoy attending local games you should definitely visit Mercedes-Benz Arena, which can be found 45 miles (72 kilometers) to the west of Westhausen. Wise travelers that are thinking about finding accommodation close to the stadium, make a reservation in the Le Méridien Stuttgart or Waldhotel Stuttgart. Situated 45 miles (76 kilometers) away from the heart of Westhausen is Stuttgart Central Station Airport. Find nearby Travelocity-listed accommodation at Steigenberger Graf Zeppelin or Maritim Hotel Stuttgart. Booked a non smoking room. The hotel room had an overwhelming smoke smell. We checked in about 8:30, and since we had booked it we decided we should stay instead of drive the remaining 3 hours home and losing the money. Should have kept driving. I felt like I was sleeping in the middle of a casino because the smoke smell was so bad. Not sure what their definition of non-smoking room is? That and coupled with the noise that was coming from downstairs or any noise for that matter. The walls allowed every noise to come through. Some people came back from wherever and the paper thin walls didn’t keep their noise from waking my wife and I. I woke up and showered in an attempt to clean the smell off, used our swim towels that we used at our previous hotel to dry off because the towels provided by the hotel smelled. I wanted to leave there ASAP. We didn’t even attempt the breakfast. I looked at it, bypassed the dilapidated mystery meats, took some yogurts for the road and left immediately. This was a lovely hotel that is attached to the thermal pools above the town of Aalen. It was so nice to soak in the thermal pools.